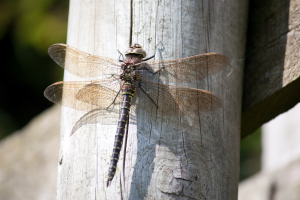 Observation - Common Hawker Dragonfly (female) - UK and Ireland. Description: Brown bodied dragonfly with greenish yellow spots on body. This was flying around on a Harris croft, settling on anything - I have some great shots of it resting on my husband's forehead, later it was sitting on my arm. Brown bodied dragonfly with greenish yellow spots on body. This was flying around on a Harris croft, settling on anything - I have some great shots of it resting on my husband's forehead, later it was sitting on my arm.